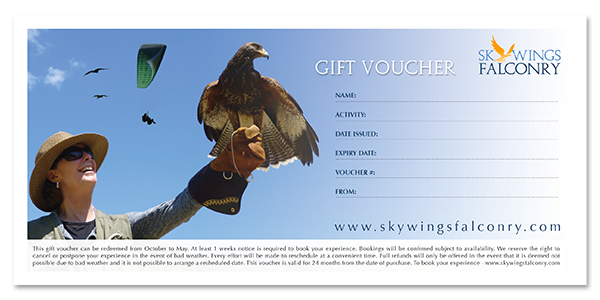 Give someone the gift of a Parahawking Tandem Experience. Treat family or friend to an incredible Parahawking Tandem Experience. Parahawking is a once in a lifetime experience which combines adventure with the ultimate bird of prey activity. Surely a bucket list item for any bird lover or thrill seeker. Once you complete your purchase, we will email you the personalised Gift Voucher. The experience can be booked directly with us, time and date subjuect to availability. The voucher will need to be presented to us on the day. Terms and Conditions apply.